“So, when exactly should one begin to feel comfortable at a new job, I always feel nervous?” I asked my boyfriend, now husband, at the age of 18. Hmmm, you should already feel fine, it’s been 6 month,” he said. This was the first time I knew something was wrong and began to investigate my symptoms. The result: social anxiety and panic disorder. I was naturally quiet, so first attributed my anxiety to shyness and transitioning into adulthood. I had just landed my first real job, as an Administrative Assistant at the former World Trade Center and felt the pressure to perform, and did well, receiving regular praise. The years passed and I could not shake off the daily anxiety of that initial interaction (and extras that annoyingly tagged along heart racing, sweating, blushing, constantly being on fight or flight mode). Sometimes all was well. Other times Dejavu, it was as if I was meeting my colleagues for the first time all over again. As an Office Assistant, I had an open cubicle and could hear those approaching, by listening to their footsteps and voices. The wait for them to reach my workspace was like getting on a haunted house rollercoaster ride and being tapped on the shoulder by different monsters one by one, only instead of ghosts and gremlins they were: worry, panic hyperhidrosis, and the worst monster of them all blushing. I hate that monster, it’s the one that screams the loudest and makes me look sooo weak and stupid. After a few minutes, the ride is over, symptoms subside but depending on the person who I conversed with, they either ignored my blushing and nervousness, left confused, or thought I had a crush on them (women included)! It didn’t happen all of the time, but often enough for my manager to once describe me as being “shy and sheltered.”Now who wants to be remembered like this? I guess being young worked in my favor in that respect. Then 9/11 occurred and I was shaken like the rest of New York having lived through and survived the attacks. The anxiety was ever more present and this was the first time I reached out for professional help, at the age of 21. I visited a psychiatrist who had basic exposure with social anxiety, only textbook knowledge. I remember her saying “but I don’t understand you’re so resilient.” What a waste of $125 cash per session! After six sessions, I felt like she was gaining more from the experience than I was so no longer visited. However, I did read through and completed the self-assessments found in the workbook she gave me. how can a title like “Dying of Embarrassment” by B. Markway/ A. Pollard not draw anyone in suffering this condition? That title perfectly described the inner turmoil, social anxiety and panic disorder that was slowly killing me. I yearned to be young, carefree, liberated from these monsters and it hurt so badly to constantly worry and be embarrassed by the most minimal of interactions with others: worrying over my sweaty hands (I’ve had people literally wipe their hand on themselves after shaking mine) blushing excessively and people misinterpreting my blushing for attraction and feeling like a weirdo. At this point, I had several chats with God and asked that he cure me, because this felt like a disease. I worked another corporate job at a top firm, surprisingly people saw beyond my interview jitters and hired me lol, if they only knew this was an everyday feeling. The symptoms persisted and the response by others was the same. I even had and executive catch me mid-panic attack and say ‘it’s ok, they’re only people’. He knew I was nervous to meet high ranking leaders visiting the office, but it wasn’t just them, it could be the office intern visiting my reaction would be the same. I was about 27 at this point. The erythrophobia, fear of turning red that often works against itself, came after several years of having my facial redness pointed out. 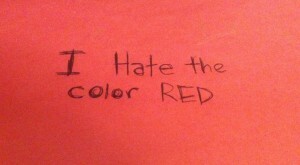 Did I mention I hate the color red? I’ve lived with social and panic disorder condition for 15 years, almost a half a lifetime. Now I’m a Mother of 3, coping and fighting not to let them take over my purpose in life and my kids’ childhood. With social anxiety you develop coping mechanisms of avoidance. Yes, I should take them to the playground, and yes it’s ok for them to meet new friends. Daily activities around the children don’t allow me to dwell on my personal worry as much, but it’s still there. I make sure my kids lead a normal childhood with lots of activities, hugs and kisses, because I’ve always wondered where things went wrong with me. As contradictory as it may sound, I joined a civic association to raise awareness of the neglect in our neighborhood. We’ve met with local leaders and though I’m nervous as heck and blush, I make sure my voice is heard. Maybe they attribute my redness to being passionate to our causes ☺. In any case, working on making small changes and working on being accepting and kind to myself. If you suffer from social anxiety or panic disorder know you are not alone. It’s a daily struggle but be proud of your small accomplishments, push through your symptoms and breathe…breathe deeply, you are worthy!